King Bed - Hallway Bunks - Sofa Sleeper -- Convenient Ground Floor. Close to Pool. 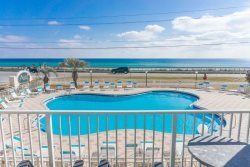 Are you looking for the perfect Destin vacation condo? This gorgeous 1-bedroom, 2-bath unit overlooks the Gulf of Mexico. Convenient 1st floor location is like having a refreshing swimming pool right in your own backyard. Just steps away from the beach. Small dog pet friendly. Free beach set-ups included (umbrella and 2 chairs) in season - saves you $30/day. Call or book online today!